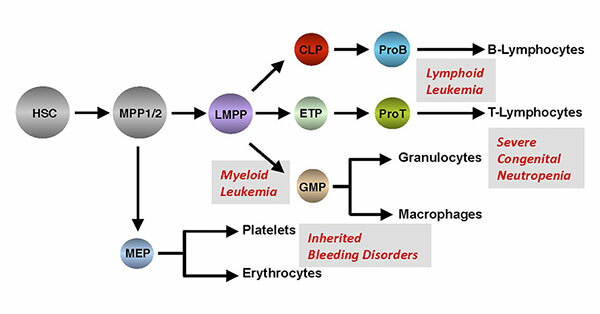 The primary goal of our research is to understand how the production and differentiation of hematopoietic and immune cells are normally regulated and how defects in this regulation can lead to leukemia and lymphoma and other hematopoietic diseases including rare blood disorders. One part of our work focuses on two key transcription factors and histone modifiers, Gfi1 and Gfi1b (“Growth factor independence 1 and -1b”) that control the critical steps in hematopoiesis ranging from hematopoietic stem cells (HSCs) and lineage determination of multi-potential progenitors to immune effector cell function, red blood cells and platelet production. Gfi1 and Gfi1b are differentially expressed throughout hematopoiesis and have both common and lineage specific functions. Human GFI and GFI1B are mutated in patients with severe congenital neutropenia and inherited platelet deficiencies (IPD), respectively. Gfi1 is an onco-requisite factor for T-cell leukemia (ALL) and a genetic variant of the human GFI1 gene is associated with acute myeloid leukemia (AML). We aim to understand the biological role of Gfi1 and Gfi1b in normal hematopoietic differentiation and in leukemia and lymphoma and will use these findings to unravel molecular mechanisms and to use this knowledge to develop novel diagnostic tools and therapeutic targets. The BTB/POZ domain protein Miz-1 was originally discovered as a co-factor of the oncoprotein c-Myc enabling it to act as a transcriptional repressor. 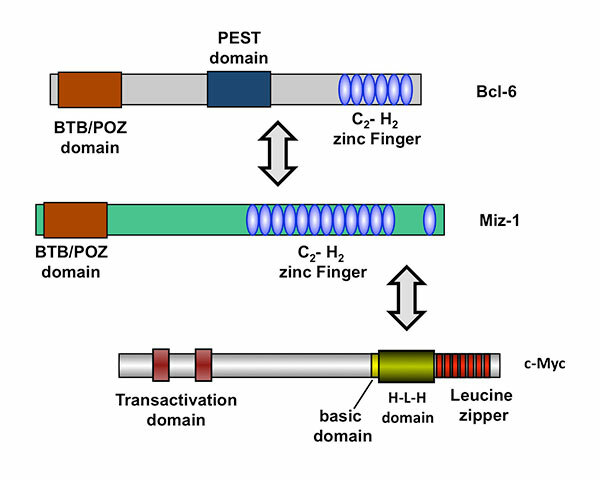 However, Miz-1 is also able to regulate target genes independently of c-Myc by recruiting co-factors such as p300, Bcl-6 or Dnmt3a to promoters. We generated conditionally deficient mice and could demonstrate that Miz-1 has c-Myc independent functions in defined steps of early B- and T-cell development at stages that are dependent on interleukin 7 signalling. In addition, we discovered a new Miz-1 pathway that targets the stability of the tumor suppressor and gatekeeper protein p53 and thereby regulates steps during pre-T cell development when V(D)J recombination occurs to assemble T-cell receptor genes. The c-Myc protein, which binds Miz-1 through its helix-loop-helix domain has been implicated in the generation of many different lymphoid malignancies and we are studying the effect that ablation of Miz-1 can have on the activity of c-Myc in the process of lymphomagenesis. 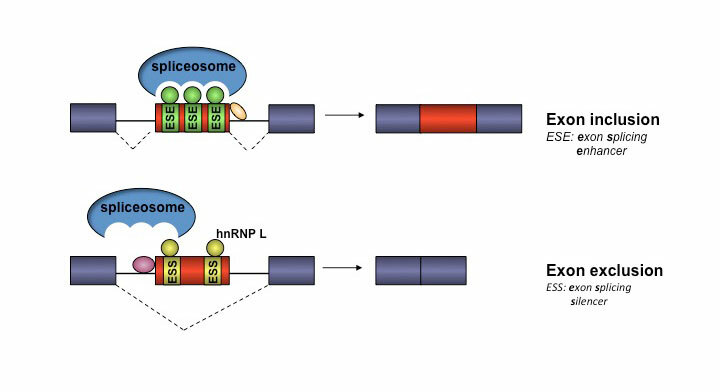 Heterogeneous ribonucleoprotein L (hnRNP l) is an RNA-binding protein that also regulates alternative splicing of CD45 pre mRNA. 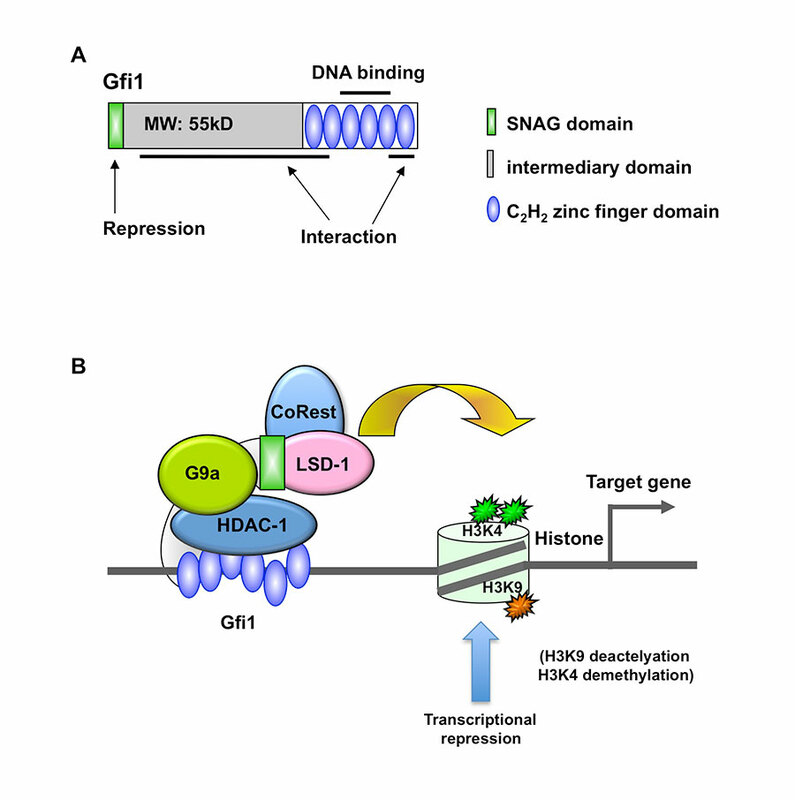 Since the alternative splicing of CD45 affects the differentiation and activation of T-cells similar to Gfi1, we decided to test whether the functions of Gfi1 and hnRNP L converge. We have generated conditional knockout mice and found that hnRNP L regulates T-cell activation, as expected, but also the migration and egress of thymocytes to peripheral lymphoid organs. In addition, our most recent findings indicate that hnRNP L enables HSCs to properly regulate cell death and DNA damage response pathways.